Volvo Trucks has handed over a used FH tractor unit to Transaid. The donated truck will soon be shipped to Uganda for use in the organisation’s Professional Driver Training Project. 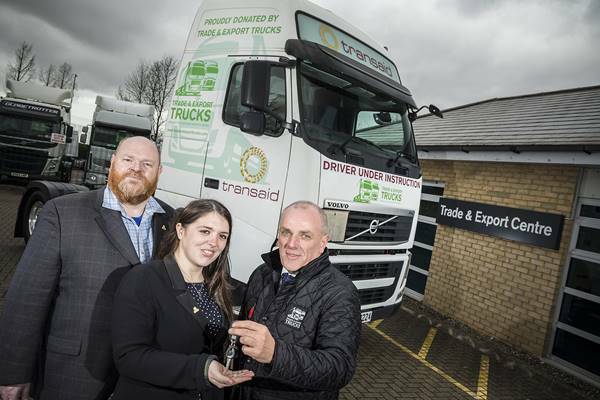 The presentation took place in January at Volvo's Trade & Export Centre in Ely, where Chris Cann, Dealer & Fleet Sales Development Manager - Used Trucks, presented the 6x2 tractor unit to Transaid's Florence Bearman, Head of Fundraising and Neil Rettie, Road Safety Project Manager. The donated 2012 Volvo FH Globetrotter XL, 6x2 tractor unit comes direct from Volvo's approved Used Truck stock and features a 460hp Euro-5 engine coupled to a 12-speed I-Shift automated transmission system. The 3900mm wheelbase chassis will be used to haul a platform trailer in Uganda, loaded with an empty container for driver training. "We wanted a modern truck with a large cab to fit two extra passenger seats. This will permit us to accommodate three trainees at a time, in addition to the driver trainer. Volvo's FH Globetrotter cab, with its flat floor, fits the bill perfectly. Chris Cann and his team at Ely have even arranged to supply the extra seats," reports Neil Rettie. "The used Volvo FH donation doubles our current training capacity in Uganda and comes at a time of vast economic development in the country which will create a huge increase in demand for skilled truck drivers," Neil adds. The Trade and Export Centre in Ely, Cambridgeshire is part of Volvo Group UK Ltd. The centre specialises in both direct UK Trade to Trade sales, as well as sales to export customers based outside of the UK and Ireland. Volvo Trucks has been a strong supporter of Transaid since becoming a corporate member in 2009.